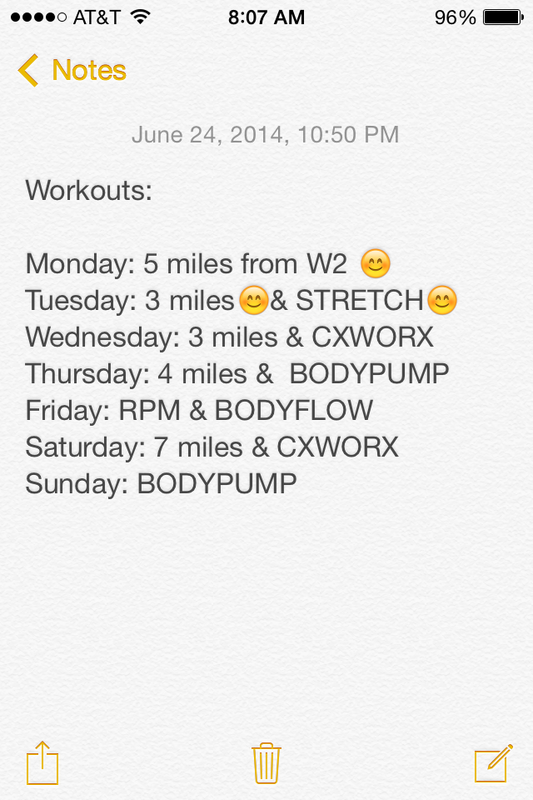 On the car ride home from Colby’s 70.3 half Ironman in Syracuse, Amy and I figured out our workouts for the week. She likes to keep them in her iPhone notes, so I tried that for this week. Above you can see I moved my 5 miler from my week 2 training to this past Monday. I put a 🙂 after I finish the workout. I didn’t mean to run so many days in a row this week, but that is just how it goes for now. I just ran on the treadmill this morning, but it was a lot of walking. I finished with 2 miles because I was going over my CXWORX notes and saying the workout cues out loud to myself. I’m doing my first taping this afternoon and I’m pretty nervous. 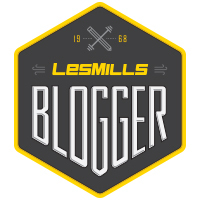 I would love for this to be a good tape so I can submit myself teaching to Les Mills for certification approval. It has to be one take, the music/mic levels need to be good and you have to see at least 5 class members in attendance. The challenge of CXWORX 15 is there are no stops between tracks. My throat gets so dry because I don’t have time to grab water!! I got new Reebok/Les Mills clothes in the mail yesterday!! 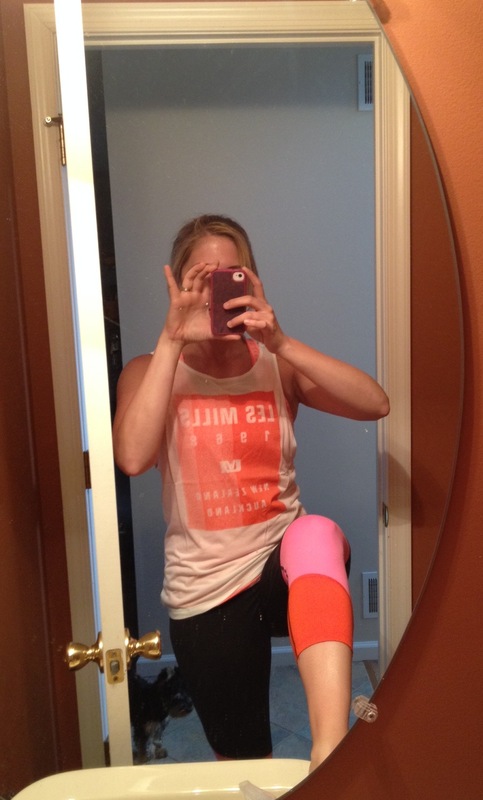 I lifted my leg up so you could see the bottom of the capris 🙂 The top is from the Les Mills line, and I loved that it was orange for CXWORX colors. It is a little big, especially on the shoulders but I’m still going to wear it for my taping today. Baby Bella missed us soooooo much after our trip. When we were getting ready for bed, she jumped up onto our (very high!!) bed! She usually sleeps in her little bed in a playpen in our bedroom, but I let her snuggle with us for a half an hour before I moved her to her bed. 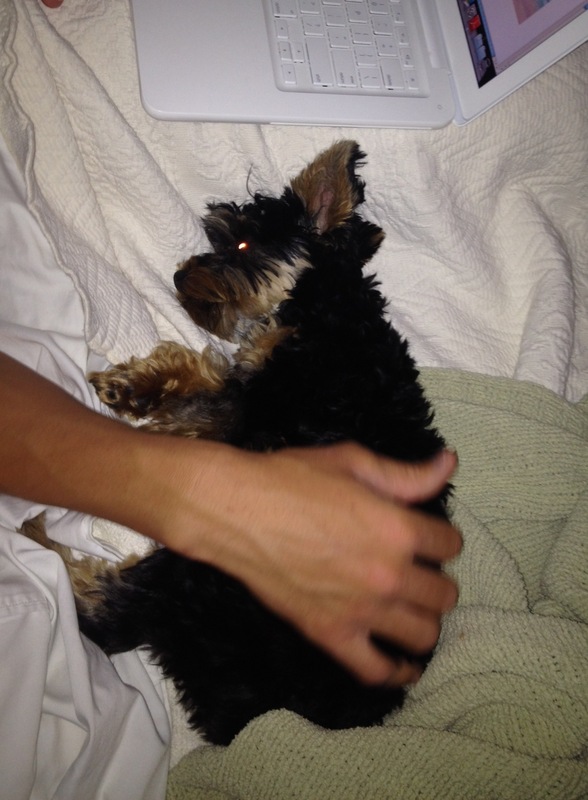 She is so tiny, I don’t think she would be safe in our bed all night! She finally weighed in at 5 lbs at the vet yesterday! Since she is 7 months and hasn’t been getting much bigger, I think she might be close to full grown! Tags: Bella, CXWORX, CXWORX 15, Les Mills, Les Mills CXWORX, Les Mills Reebok, Les Mills Taping, Reebok, running, workout log, Workouts!